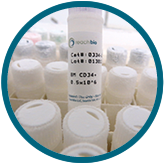 ReachBio Research Labs now makes it easy for you to purchase Human Peripheral Blood Mononuclear Cells (PBMCs) online! All blood is obtained from healthy human donors under IRB-approved protocols and processed within 24-30hrs of the initial collection. Donors have been screened and found to be negative for a number of infectious agents, including HIV, HBV, and HCV. Online purchase is available for customers in the USA. For all customers purchasing PBMCs outside of the USA, a ReachBio team member will reach out to you within 24hrs of your purchase to go over product pricing (pricing for Canada same as USA), shipping, and handling costs. Click here for more information and to shop now! ReachBio Research Labs is committed to operating under the highest ethical and legal standards for the acquisition of human cells used in our Primary Human Cell Products and Contract Assay Services. As such, all primary human cells used and sold by ReachBio Research Labs are sourced within the USA under protocols that have been obtained via Institutional Review Board (IRB) approval. IRB are also known as Independent Ethics Committees (IECs) or Ethical Review Boards (ERBs) and are governed by Title 45 of the Code of Federal Regulations (CFR) Part 46.